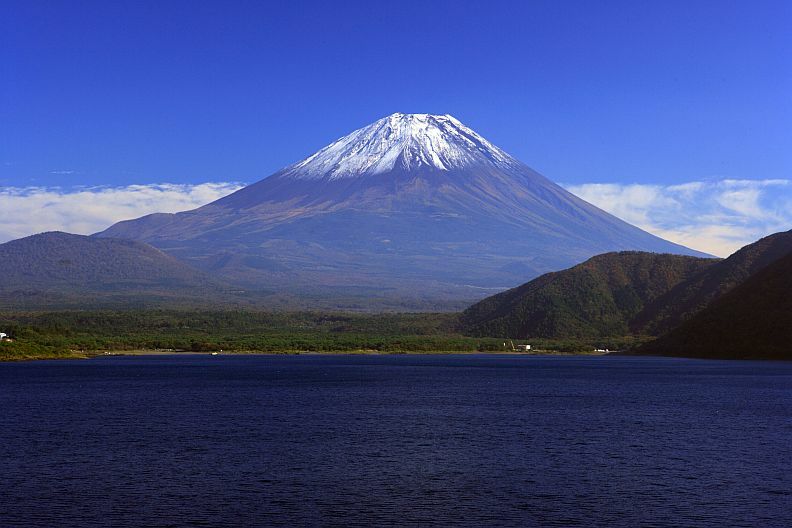 Mount Fuji (Fujiyama), known to the Japanese as Fuji-san, is the highest mountain in Japan. It is 12,389 feet (3,776 m.) high and is located on the island of Honshu, about 60 miles west of Tokyo. The mountain is an inactive stratovolcano that last erupted in the early 1700's. The peak is known throughout the world for its great beauty and nearly perfect symmetry. Its top is crowned in snow for much of the year and is often hidden by clouds. To the Japanese it is a sacred mountain, and thousands of pilgrims climb to its summit every year, mostly in the summer months of July and August. The volcano has long been mentioned in Japanese literature and pictured in Japanese art. The first ascent is thought to have been made by a monk in 663 AD. The first ascent by a foreigner was made by British diplomatic representative Sir Rutherford Alcock in September 1860.